May 12 2002 Kazakhstan – The Russian equivalent of the NASA Space Shuttle, called the “Buran,” was destroyed. The Buran was stored in a hangar in Kazakhstan. 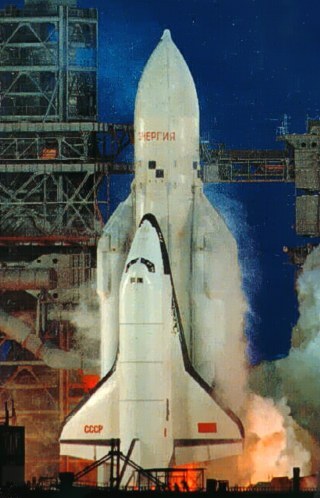 On May 12 2002, that hangar collapsed unexpectedly, killing eight people and destroying the Buran. The Buran was designed and built in response to the U.S. Space Shuttle, but unlike the Shuttle, the Buran was designed to operate either manned or unmanned missions. It’s only orbital flight included a completely automated landing at a runway at Baikonur Cosmodrome (similar to the Kennedy Space Center runway strategy at that was used for the NASA Space Shuttle). Like the Shuttle, the Buran had a carrier aircraft for transport, but it used the Russian Antonov instead of a 747. The only orbital flight of Buran was on November 15 1988 from Baikonur Cosmodrome. It was a three-hour unmanned flight, and made 2 orbits. Until the flight of the U.S. X-37 orbital vehicles, it was the only unmanned winged space vehicle to fly into orbit. This entry was posted in Leadership lessons from the Space Race, NASA Space Shuttle and tagged Kennedy Space Center, NASA, Soviet Space, space race, Space Shuttle. Bookmark the permalink. While this debate was underway a collective letter was sent to the Soviet government by workers on the project, including the cosmonauts Volk and Leonov. This letter argued that the first flight should be piloted, as was the American space shuttle. In order to resolve the issue, a special commission was appointed to study the alternatives. The commission decided in favor of the two orbit automated flight.